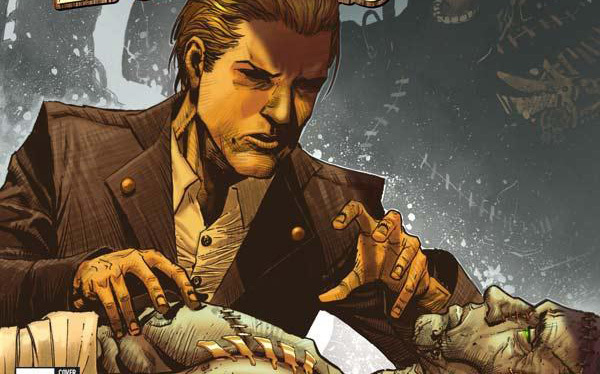 MYCROFT HOLMES #2 Review @comicstitan | Warped Factor - Words in the Key of Geek. Tony’ll be in his fort. 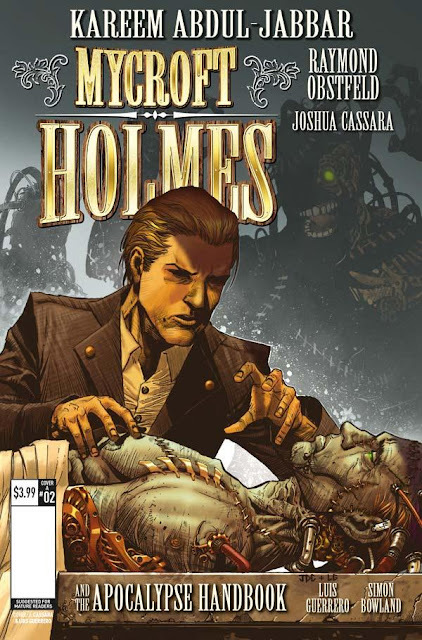 Let’s beat about no Victorian bushes – we’ve been fans of Mycroft Holmes since issue #1. Yes, all right, it’s only on issue #2, but one of the many joys of the Mycroft Homes comic-book is that we feel like we’ve known Mycroft himself all our lives, however old or young we are. In a single expressed idea, Mycroft is the older brother even Sherlock Holmes admits is cleverer than he is. In more words, he’s become something of a recluse by the time we know him in the Sherlock Holmes stories, generally preferring the silence of the Diogenes Club to the bustle of the world, but with fingers in more pies than anyone can know about. Kareem Abdul-Jabbar’s Mycroft though is the younger, stripling version of that figure, the remarkable brain in a rakish young body, with fear of absolutely nothing he can out-think – which is most things – and a passion for sensual pleasures. It’s a glorious idea, bringing the steampunk and revelling in a version of Sherlock Holmes stripped of his somewhat tiresome asceticism and roaring through the world. Abdul-Jabbar’s Mycroft is to the Sherlock Holmes stories what Anne Rice’s Lestat is to vampire stories – a version that paints in colour, in vigour, in a kind of rock and roll sensibility that gets its inspiration from the fine and sensual things in the world. He’s the Keith Richards, the Captain Jack Sparrow of the Holmes boys, and as each issue arrives, he makes us ask again ‘If this character has been here for the writing all this time, how come no-one’s done it this well until now?’ The reason, we have to conclude, is that no-one’s been Kareem Abdul-Jabbar until now. In this issue, Mycroft is shown into what he calls ‘the world’s largest toy shop’ of weapons of steampunk mass destruction, made a good idea only by virtue of their lack of function. But he quickly gets down to literal brass tacks, explaining what a major attack on the British Library in issue #1 was about (an idea that not only makes sense but echoes one of the best espionage thrillers of recent generations, Hugh Laurie’s The Gun Seller), and then deploys the Holmes method of deduction to establish a link between events in the British Library, a manual to make some of the steamiest-punk weapons of mass destruction ever devised actually work, and America. Cue a scene-shift to Philadelphia, where an impossible aquanaut is getting distinctly trigger-happy with a ray-gun. Yep – an actual ray-gun, attached to someone in an early diving suit. There’s a touch of Ambassadors of Death about the whole thing, but with a rather more modern visual comic-book aesthetic in terms of the effects of this particular weapon. What Abdul-Jabbar has given us in just two issues of Mycroft Holmes is one of the best twists on an original idea in years, plus a pulse-pounding mystery adventure that just makes you want more, and more, and more. It’s this year’s Death Sentence in terms of naturally building complexity and characterisation that drags you in and won’t let go. Shall we talk about visuals? Didn’t we already cover this in the review of issue #1? Raymond Obstfeld and Josh Cassara do a couple of incredibly neat things with the visuals on this comic-book. Handily, you only need to look as far as page 1, panel 1 of issue #2 to see one of the main strokes of artistic nous at work – the shot of the warehouse full of defunct deadliness looks like a watercolour, or more like an engraving – it gives you the idea of shapes that make up the arsenal of devastation (including, incidentally, something that looks not a million miles away from a steampunk Dalek, sitting on a shelf), then brings in a kind of hazy, almost foglike Victorian atmosphere in the mid-ground, to evoke the atmosphere of the time (or at least our perception of the time). But then, unexpectedly, the shapes of things continue to be visible through that haze, going back and back in the scene to give us real perspective on the size of the place. It’s both having your visual cake and eating it – the atmosphere, the brokenness of things left alone in the dark and the haze, matched with the precision of physical spaces and structures that shows an age of industry and engineering. It works to create a sense of both the reality of the world into which we’re invited, and a sense of mystery that is the essence of steampunk – that ‘how could things have been done with the genius of the time?’ question that underlies all the best steampunk fiction. Clever, clever artwork. The characters at all times look very distinctly drawn, rather than captured, there’s an old-school approach to the nuts-and-bolts of character-creation through art, and some might argue that such a style leaves mid-shots and group shots feeling a little representative, rather than real – but that’s an argument given the lie when Obstfeld and Cassara need us to understand a character’s thought-process or emotional turmoil – when the shots come in close, they’re more than capable of conveying what they need to, to sell the moment or the storytelling beat. There’s some beautiful sepia work to visually represent memories and a story told, matched with a raggedness of panel-edging, as if these memories have been torn from a scrapbook and set down before us. And along with the ‘ordinary’ scenic artwork and the characters, this issue calls on Obstfeld and Cassara to deliver two ‘monster battles’ – one with the impossible aquanaut in Philadelphia, and another, back in Mycroft’s London, with an homage to Frankenstein that has some something a little Cyberman about it, something a little Borg, more than a hint of Adam from Buffy the Vampire Slayer and a whole chunk of innovative bronze and brass steampunkery just to make it its own thing. Both these sequences are delivered with a combination of eye-popping ‘what-the-hell?’ surprise and physical vitality, making the issue a proper page-turner in its own right, even once you’ve stopped marvelling at the concept and delighting in the characters. And if you thought we were going to ignore the contribution of the colourists to this issue, you were out of your tiny minds. Luis Guerrero – a walking hallmark of colour quality, especially when it comes to working with light – and Simon Bowland do exceptional work here that lifts the comic-book out of the realms of just the extraordinary and into something like a treasure trove. In particular, all the steampunk tech, seem up close, has a glow to it that lifts it above the ‘ordinary’ colours and textures of the Victorian world – it’s a subtle note that seems to say ‘this is not of the world that’s come before, but of the world to come.’ And especially when the tech is used, there’s a quality to the light that’s positively filmic – the events in Philadelphia are partially explained through an exterior shot of a building with weird blue-white light exploding from all its windows, and it works superbly. Beyond the ‘special effects’ though, there’s that hallmark of Guerrero excellence in comparatively ‘ordinary’ lighting scenarios – light through windows, lit rooms with shadowfall, even some silhouette panels with just a laughing mouth picked out to give the emotional tone of the scene. To cut a long story short, Mycroft Holmes, two issues in, is looking like the must-read non-Who comic-book of 2016. Go down to your comic-book store, pick up the first two issues, and then build a fort and camp there till issue #3 is released. Go now – I’ll be in the fort in front of you.